Tumbleweed / Samurai Trimmer - FREE Shipping! 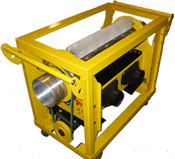 The Tumbleweed from GLD Manufacturing is a high performance leaf-trimming machine. Engineered with innovative, high quality standards and heavy-duty industrial parts TumbleWeed is "A Cut Above The Rest". It is used in the harvesting and processing of essential oil producing plants and aromatic herbs, like rosemary, oregano, basil, mint, lavender, coriander, Parsley and to prepare essential oils and mixed flowers for Potpourri. The Tumbleweed's tumbler and blades can remove leaves without damaging the plant while the powerful waste recovery system keeps the work area clean from left over plant matter. The leaf waste is automatically deposited into catch bags for easy and clean disposal. The Tumbleweed features Dual Vacuum Outlets for ultimate suction. 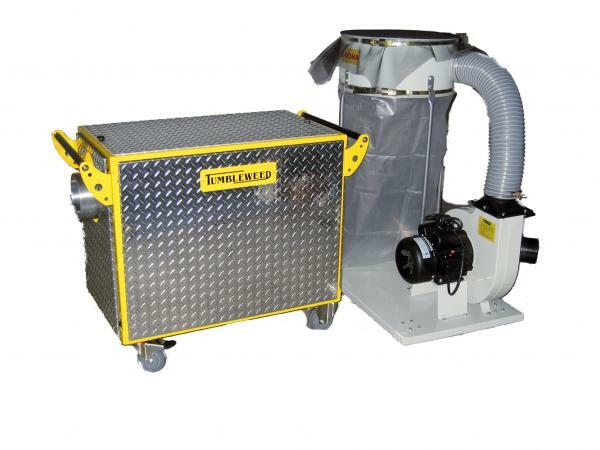 Each unit is accompanied by a 1600 cfm Vacuum powerhouse with two 4 inch hoses for maximum suction. 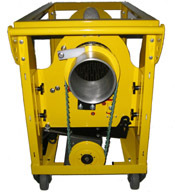 Each unit has an industrial cleaning roller. When the drum rotates, so does the roller, thus, no roller build up. Machine is pressure washable and fully serviceable. The checkerplate aluminum panels are removed during use and cleaning. The unique decking design makes them easy to remove; no bolts! After use, replace the panels for clean and easy storage. 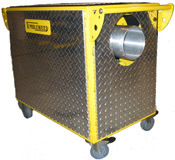 The swivel casters can be locked for use and storage and unlocked for easy mobility. Life long Accu-Link belts belts are used to rotate drums. These strong belts are solvent resistant. Tumbleweed has an internal adjusting system allowing you to load the drums from either side. 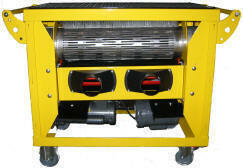 Greasable reel bearings with microthin bedknives ensures efficient cutting and trouble-free use. The Tumbleweed machine has unique blade positioning that guarantees your crop to get more blade action than the competitor's.